Chevy V-8 Distributor MSD Billet Distributors have a 6061-T6 billet aluminum housing, accurate to plus or minus .001". 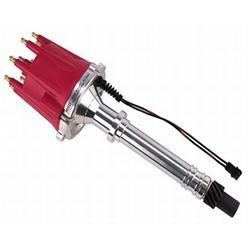 High output magnetic pickup provides an extremely stable and accurate ignition signal at any RPM. .500" diameter steel shaft rides in a sealed bearing at the top, and an extra long sintered steel bushing at the bottom. Keeps shaft stable to over 10,000 RPM. Two o-rings located at the bottom to prevent oil leakage. 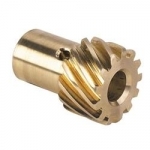 An assortment of springs and bushings are included to allow adjustment of total mechanical advance and advance curve. 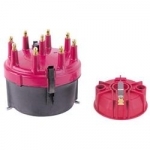 Cap and rotor included. 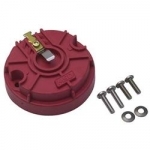 NOTE: Must be used with an MSD 6, 7, 8 or 10 Series ignition box or similar unit.